Andrea Michelbach joins Spaceworks as an intern through September 2015. Spaceworks is pleased to welcome its Summer 2015 intern: Andrea Michelbach! Andrea Michelbach is a new Tacoma resident who is eager to get to know local artists and businesses through her work with Spaceworks. During her internship, she will help out with a range of projects and is particularly excited to lend a hand with grant development, impact measurement, and the rolled-up-sleeves work of events and art installations. 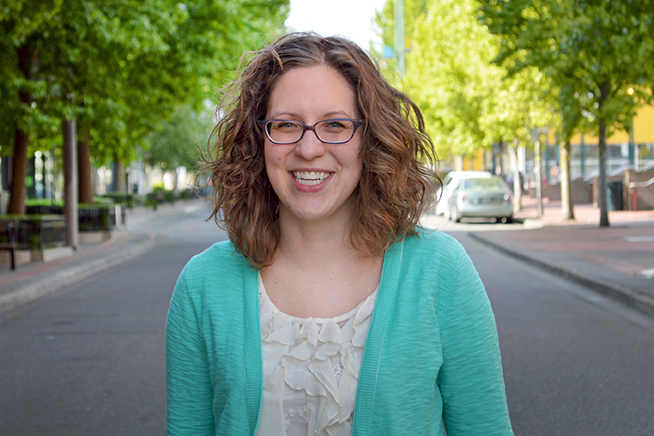 Andrea holds a bachelor’s degree from Walla Walla University in English with a concentration in Creative Writing, and a master’s degree from the University of Washington in Museology with a specialization in Museum Evaluation. She has worked in consumer healthcare publishing and a variety of roles in museums, including visitor services, private events, education and communications. A long-time believer in art, culture and creative writing, she has volunteered at a commercial art gallery, served on the board of an historic house museum, helped shape a city-wide arts organization, and taught poetry lessons to high school students visiting an art exhibit. A Northwesterner at heart, Andrea grew up in North Idaho in beautiful Coeur d’Alene, where she developed an affinity for camping and skiing; went to school and worked in Southeastern Washington in Walla Walla, where she fell in love with Washington state’s geology; and most recently lived in Seattle, where she completed her graduate degree and worked for three and a half years at the Burke Museum. Perhaps because place has always been so important to her, Andrea likes to operate on a local level where she can improve the communities and lives of those around her, whether that means engaging them with arts and culture, getting them outside to explore the natural world, or cultivating their creative expression. Accompanying her from Seattle to make Tacoma “home sweet home” is her husband, Karl, and their black cat, Norm. Andrea enjoys camping, cooking, correspondence, and playing music, which, for her, means piano and half an accordion. You can reach Andrea at andream@tacomachamber.org.